The presence of green worms in the garden is synonymous with declaration of war. That little beast is the larva of what soon will become a harmless butterfly or moth. But no matter what the critter’s heritage, its current diet consists solely of plant material that you probably aren’t interested in sharing. Some green worms are active during daylight hours, while others skulk around under cover of night. 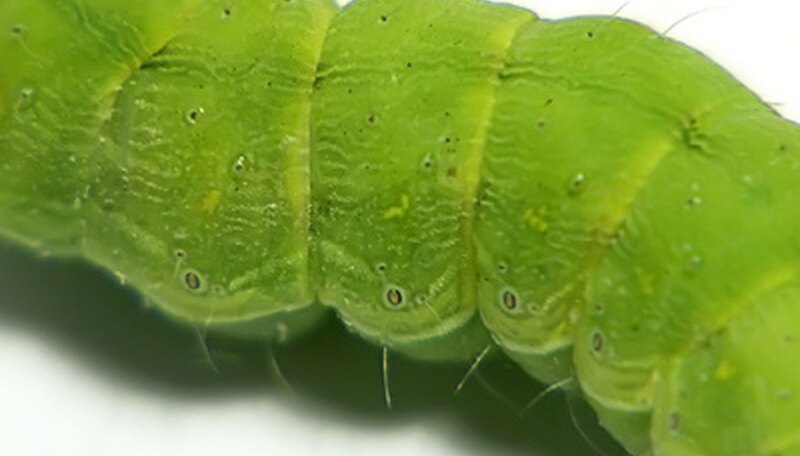 Cutworms, armyworms and tomato worms are among the most common garden larva, and the variety of your pest will vary depending upon your location. Take your garden back with simple pest-control home remedies. Inspect your plants twice daily. Check early in the morning when daytime feeders are at their hungriest. Go back out after dark with a flashlight to catch nocturnal varieties at work. Hand-pick the little green worms from your plants. Dig through the top inch or so of soil lightly with your fingers every day. You’ll probably turn up some green worms. Make collars to repel stem-eaters and basal feeders such as cutworms. Cut the bottoms out of waxed paper cups and sink them about an inch deep into the soil surrounding young seedlings. The worms won’t be able to negotiate climbing over them. Spray your garden with Bacillus thuringiensis, the living bacteria commonly known as BT. This naturally-occurring organism attacks caterpillars and other garden pests. It doesn‘t kill immediately but renders pests unable to eat. You’ll probably derive great satisfaction from watching the little beasties squirm as they experience slow, agonizing deaths from starvation. Treat your plants with insecticidal soap. Make your own by combining 1 cup of water with 1 teaspoon of dishwashing soap and 1 teaspoon of vegetable oil. Apply neem oil to your plants. Coat all surfaces well. Follow the packaging instructions carefully.